Part gearheads, part speed racers, part cycle accessories salesmen, the longtime friends behind Hesh Moto are doing their part to revive Roseburg’s lost motorcycle culture. The story of Hesh Moto-Craft Co. begins in August of 2016 at the Bonneville Motorcycle Speed Trials, where two homegrown Roseburg boys realized they had virtually broken a national speed record “on a whim.” Virtually, because they didn’t file the necessary paperwork to qualify, instead opting to enter the low-key, non-competitive “Run Whatcha Brung” category. Cam Campman and B. Lane Johns just wanted to participate in the trials, be a part of the community, so they showed up to the Bonneville Salt Flats in the Utah desert — a plain so flat it’s as if some extraterrestrial doom device laser-leveled it for the very purpose for which it is now so famously used—with Johns’ custom Harley Davidson Sportster and no idea in their heads but to experience the thrill of blasting through a field of pale salt dust and shooting the breeze with like-minded gearheads. Cam Campman and B. Lane Johns. It’s not that Campman and Johns couldn’t see the obvious barriers to entering a motorcycle into the Bonneville speed trials, starting with the forbidding locale hundreds of miles from Oregon. “It’s like standing on a mirror,” Campman says of the bone-white salt flats, before describing how the sunlight glares down from the naked sky and then reflects back up from the ground, mercilessly scorching a body from every possible angle. This is a probably good time to properly introduce the two guys who had such a bike. Campman and Johns grew up in the Roseburg area when it was still relatively flush from a booming timber industry. Campman is tall, has unruly hair and, even though he’s a graphic designer by trade, you’ll usually find him with an oil rag hanging out of his back pocket. He returned to Roseburg a few years ago after spending a decade or so in Washington state. Johns stayed closer to home and speaks with that rural Oregon accent that so befuddles Californians trying to pump their own gas up here — the same one Ken Kesey got teased for during his sojourn in Los Angeles. As John speaks about the environment in which he and Campman grew up, he gazes into the middle space as if seeing it. Photo of bikes, including the record setter on left, by B. Lane Johns. Johns used to hang around Fast Eddie’s in Dixonville, where local bike legend Ed Halkyard would show him the ropes of motorcycle customization, let him turn a wrench. He learned to work on a bike under the tutelage of a master. Johns had long wanted to go to Bonneville just to experience it, but couldn’t find anyone willing to make the trek, jump through the technical hoops or spend the cash to have an adventure. Then his old friend Campman moved back to town and he was game. That title carries a lot of weight with these two. It’s a badge of honor. Even though Campman is now the creative director and lead designer for the Roseburg-based creative agency, Anvil Northwest, he’s stayed true to his roots. That oil rag in his pocket speaks volumes. “I bet we can both still start a car with a screwdriver,” Johns interjects with a sly look at his business partner. Campman laughs in agreement. During the long drive home from the 2016 speed trials, Johns and Campman knew they had to go back; they had to officially break that virtual record. But next time it would cost more money; the entry fee alone is more than $500. They needed to raise money, but they weren’t going to ask for a handout like some garage band turning to Kickstarter to raise funds for its can’t-miss album. Campman says he always admired Johns’ leather work, and he had design skills. “We just started a little brother website selling custom tees and leather stuff to help fund the next Bonneville trip,” he says. That, in short, is what Hesh Moto-Craft Co. is, really — a fundraiser. But it’s not just about raising money. Campman and Johns are trying to recapture that spirit, that enthusiasm they experienced on the salt flats. They’re trying to bring it back to Roseburg because it’s a spirit that was once right at home here. One of the challenges of getting up to top speed on the salt flats is the salt itself. 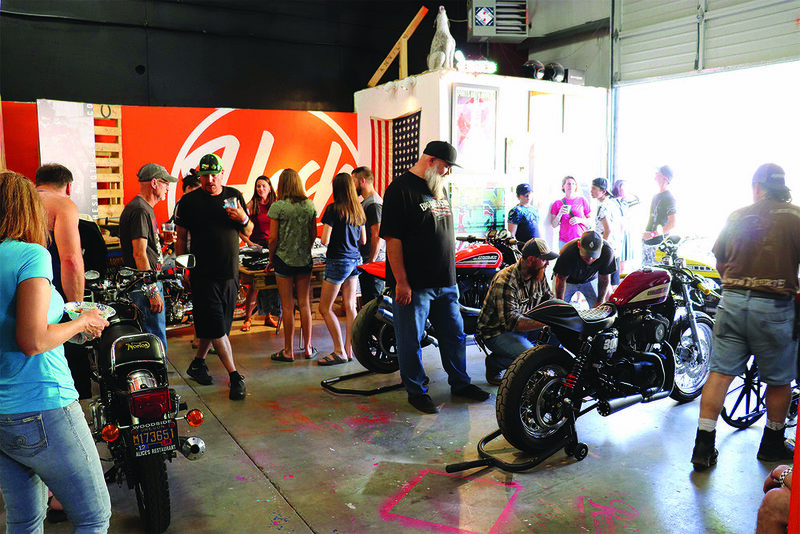 Photos of last summer’s Hesh Motorcycle Show by Kevin Eckerman. what the Hesh duo is up against now, as well—it’s an issue of traction. Campman and Johns put together Hesh Moto Show last August simply to try to drum up interest in what they were doing from any people out there who might be interested in what they were doing. It was an all-inclusive motorcycle show. People could enter whatever custom bike they wanted — it didn’t have to be a Harley like so many other shows around the country. In the end, they had more than 30 unique bikes join their party. When Bell Helmets and Chopcult (a website dedicated to promoting custom motorcycle culture) became sponsors, the Hesh boys knew they were on to something. But it was the local interest that really meant the most to them. “We’re starting to see things finally make the turn,” Campman says in a cautious but hopeful tone. The deck was stacked against the Hesh boys, but no matter. Johns and his Harley Sportster did take the record, and his buddy Campman was right there with him. Last August, Johns and Campman returned to Bonneville with that same Harley Sportster. There’s something about this bike that deserves mentioned: It has a 1200cc engine. That matters because for Johns to take the record in his bike’s category, he would have to compete against bikes with 1350cc engines, the class limit. Some of the competition had a crew of six people and a mobile workshop trailer. In other words, the deck was stacked against the Hesh boys, but no matter. Johns and his Harley Sportster did take the record, and his buddy Campman was right there with him. Now the duo have turned their attention to 2019. Johns thinks he can push his bike even further. He’s certainly not afraid to try. He says he’s done over 180 mph before; heck, he used to commute to work at 115. Hitting 130 on salt is light years harder, but he’s already been there, done that, so what’s another few mph? After that, who knows? Whatever the future holds, Hesh will continue to light a beacon for Douglas County gearheads, motorheads, weekend mechanics and professional customizers alike. And Johns and Campman will continue to offer what they can to keep the culture alive and possibly inspire a new generation of gearheads to pick up and turn a wrench.